So, you all know what my post is about today. WordPress comes with the WYSIWYG(What You See Is What You Get) editor allows user to view something very similar to the end result while document is being created. Many of the WordPress users are programmers, so they prefer to use the Plain text Editor. They feel easy to code there rather than writing in Visual Mode. So, We will show you how to remove the Visual Editor in WordPress. Why many of the users use Plain text Editor? 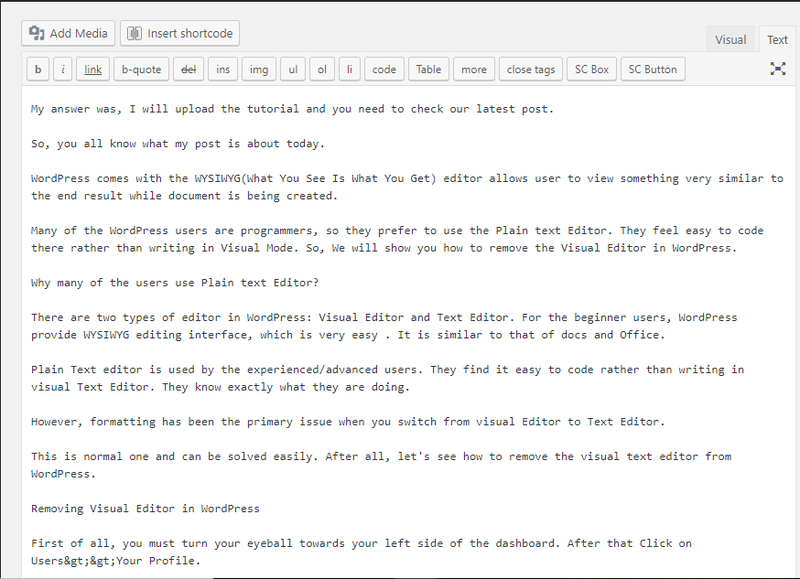 There are two types of editor in WordPress: Visual Editor and Text Editor. For the beginner users, WordPress provide WYSIWYG editing interface, which is very easy . It is similar to that of docs and Office. Plain Text editor is used by the experienced/advanced users. They find it easy to code rather than writing in visual Text Editor. They know exactly what they are doing. However, formatting has been the primary issue when you switch from visual Editor to Text Editor. This is normal one and can be solved easily. 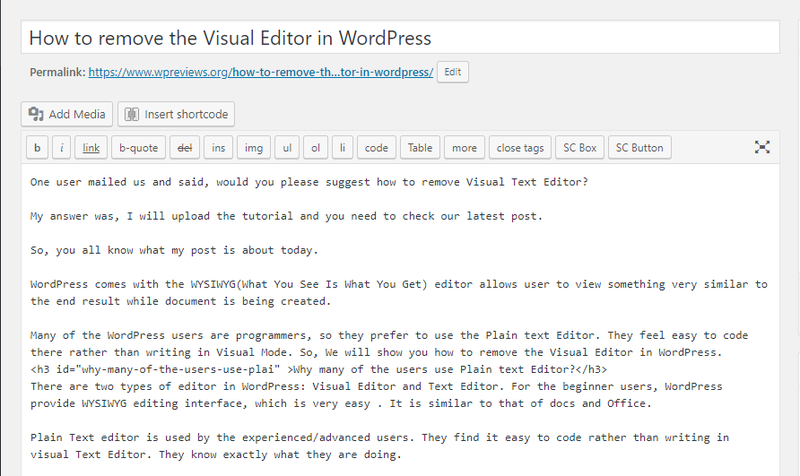 After all, let’s see how easy is removing the visual editor from WordPress. First of all, you must turn your eyeball towards your left side of the dashboard. After that Click on Users>>Your Profile. After Clicking, you will see the new page. Check the first option to remove the visual text editor from WordPress. After that don’t forget to click on Update the Profile button below to update the changes you just made. When you start writing post , you will not see the Visual Editor from now. This might solve your problem for now. I will be back with more article like this. You can see our tutorials to add WordPress Favicon. If you like this post, please like and Subscribe our Social Pages. You can find us on Twitter and Facebook.